My first visit to the Shark Lab was in 2012 and it was surreal. I had worked with sharks before, but not in this capacity. My stay was especially exciting because I turned up during May and participated in PIT (the annual census). This project allowed me to get a ridiculous amount of hands on experience while simultaneously being involved in cutting edge research. I enjoyed my time so much that I returned to Bimini the following year. While my second stint was longer, it still spanned over PIT; I remember one night we were fishing in Sharkland, which as the name alludes has a ridiculous amount of sharks, and I was stationed on the tagging boat. This vessel is responsible for taking all sharks caught by the net boats and measuring/tagging them. In one night, I got to get my hands on over 80 juvenile lemon sharks…that just can’t happen anywhere else in the world. During my second stay, I developed the idea for my thesis with Jean Finger and Dr. Tristan Guttridge and before I left, Tristan told me I was welcome to come back for my Master’s project. I started my Master’s project in January 2014. With Tristan and Jean’s help, I started conducting behavioral trials in early February. I left the lab in May to travel to South Africa to present the findings from my thesis. I will return to Bimini next May as a Teaching Assistant for Coastal Carolina University’s Biology of Sharks course. I remember meeting Doc for the first time, it was like seeing a celebrity. This was the guy who has conducted more research on sharks than anyone else in the world. I am usually a pretty outgoing person but I was so hesitant to walk up and say hi. Finally, I did and later that day he called for me by name. I thought to myself ‘He remembered my name’ and I felt like a little kid who just met the President. Before he left, I even asked to take a picture with him and its something I treasure to this day, no matter how lame it may be! Whenever Doc is at the lab, it is a much different environment- like your dad or grandpa came home. I remember one week he was visiting for a research project and he was in his room resting after a long day. I had a question about some form of social behaviour so I hesitantly ventured into his room and asked him, his responses were incredible. We talked for a while and he answered every question I had with such clarity, in ways I had never thought of before. This moment was special to me because the best shark research ever was spending time answer my questions, he was devoting time just to me. Sometimes we do something at the lab called ‘chase downs’, this consists of a bunch of boats locating and catching a mature lemon shark. Doc was driving the boat with me, Tristan, and James Brickell, a videographer. When we found a ~7ft lemon shark, Tristan and I both attempted to put a net on top of it and finally, we did. Once the net was on top of the shark I heard Doc yelling ‘Get it, Get in, Get in!’ So what did I do? I jumped into the chest-deep water, landing right next to the head of the mature animal that just freed itself from our nets. I elevated my feet off the ground, as did Tristan, and it swam right under us. There is probably no other person that could have made me do this with such a kneejerk response but soon as Doc said it, I just jumped. If you want to see a lot of species of sharks in a short period of time, the Shark Lab is the place for you. I remember the first long line check I ever went on and to this day, it’s the gold standard. We left the lab around 1am and went to the first set. The hooks were all pretty busy, pulling up tons of nurse sharks and even a lemon shark. The coolest catch was on the last line, a tiger shark. Anyone with experience in the region knows tiger sharks are far from scarce, but this guy was special. At some point in this life this shark swam through a nylon fishing net and it was wrapped around his trunk, in front of his dorsal fin. This net had been on the shark for so long that it was sunk about 4 inches into his flesh. 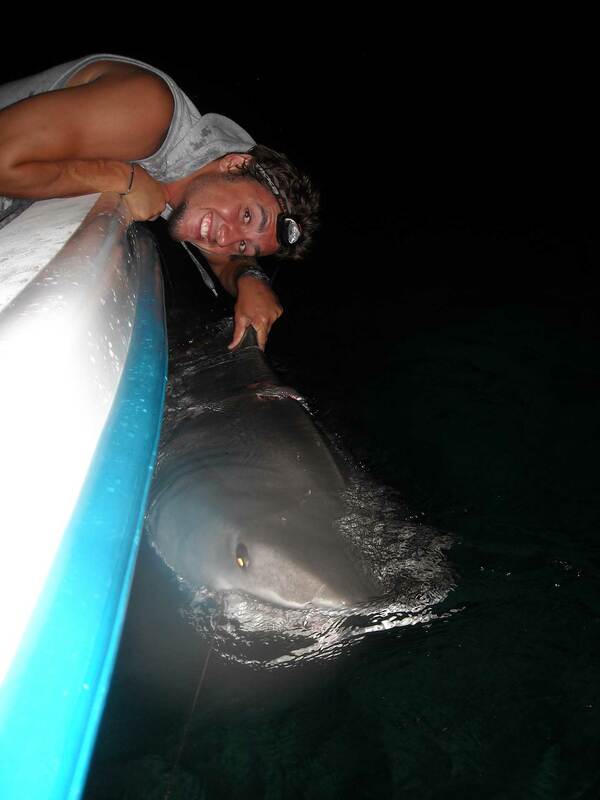 TJ Ostendorf cut the net off as we were measuring the beastie and when we were done, the shark swam away peacefully. In this profession, it is difficult to say for sure how many sharks you save, but I could tell you how many sharks have died because of my mistakes. This instance, though, was a clear example of saving a shark’s life…without us, it would have died. I remember staying up until 4am that night, waking up my parents with a Skype call to share the experience; I even saved the fishing net and still have it today. The Gulf Stream is very close to the coast of Bimini and that’s where some really big sharks like to hang out. One day, we set a line in the Gulf Stream to try and catch a big tiger. We pulled the line in and saw a magnificent creature; this shark was almost 14 ft long. The shark was so strong that it completely straightened a massive, steel hook and spat it out. The only reason the shark was still on our line was because it wrapped it’s tail while trying to get off. Eventually, while we were all in the water, we let the shark go and it swam away peacefully. Working at the Shark Lab has made my lifetime goals a reality. I knew at a young age that I wanted to study the ocean, and soon as I learned more about sharks, I knew Bimini was the place for me. The opportunities provided by the lab have made me grow as both a scientist and a person. The lab has allowed me to conduct my own research and gain valuable research experience, both of which are extremely important. If the lab didn’t exist, I would have probably pursued another biological sub discipline. Without Doc, I wouldn’t be studying sharks and I wouldn’t be living the life that I have always wanted.